One evening while we were in Costa Rica, one of the locals stopped by the house on his bicycle lugging a big cooler on the back full of freshly caught rock lobsters. One kilo was $12 and you just can't say no to that. 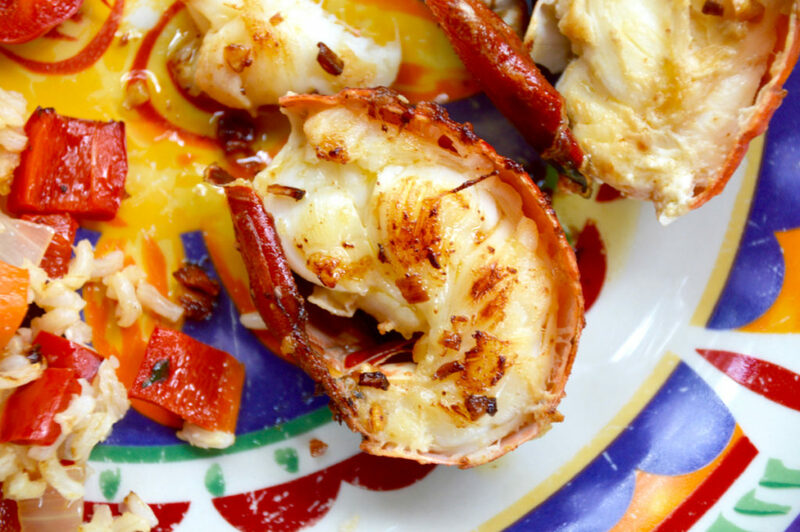 The thought of devouring freshly caught lobster sounded so good to me, and what easier way to cook it than with loads of garlic and butter? 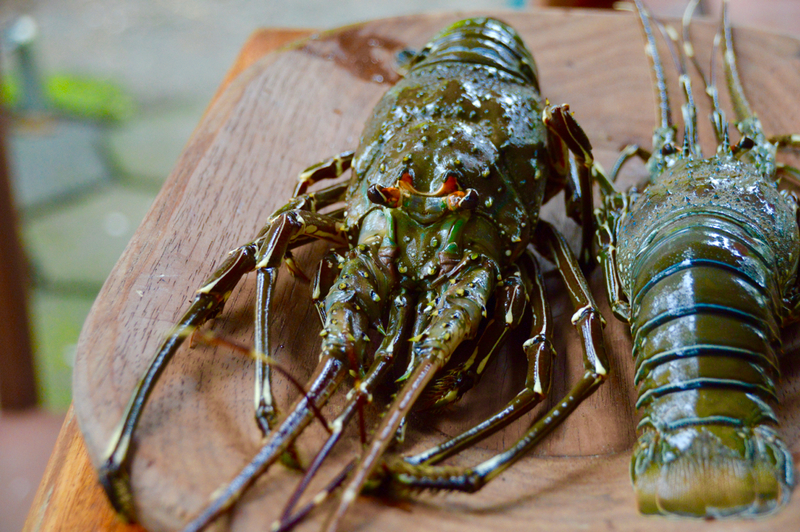 Rock lobsters are different than the lobsters we get in New England. For one, they don't have claws. The meat is mostly in the tail and at the end of their bodies, but the rest of the body doesn't have to go to waste! I have made delicious fish stews with the bodies simmering in the broth for hours for flavor. 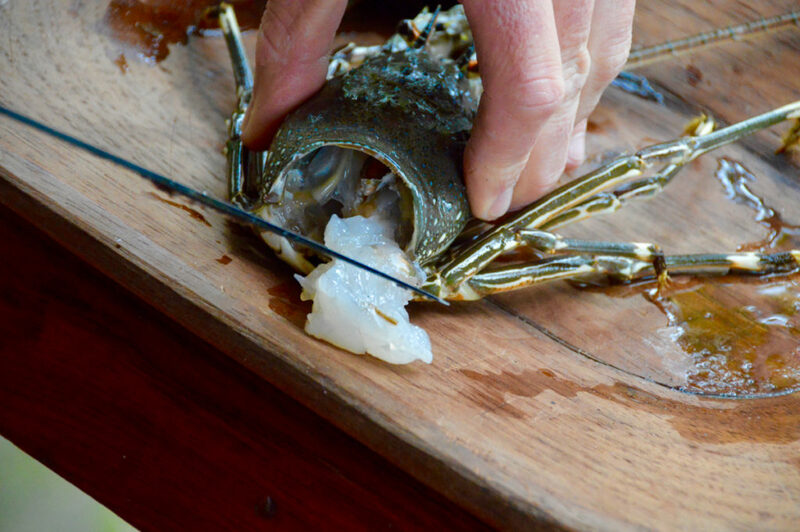 Preparing rock lobsters can be tricky too because they have massive spikes all over them, but the outcome is definitely worth it. 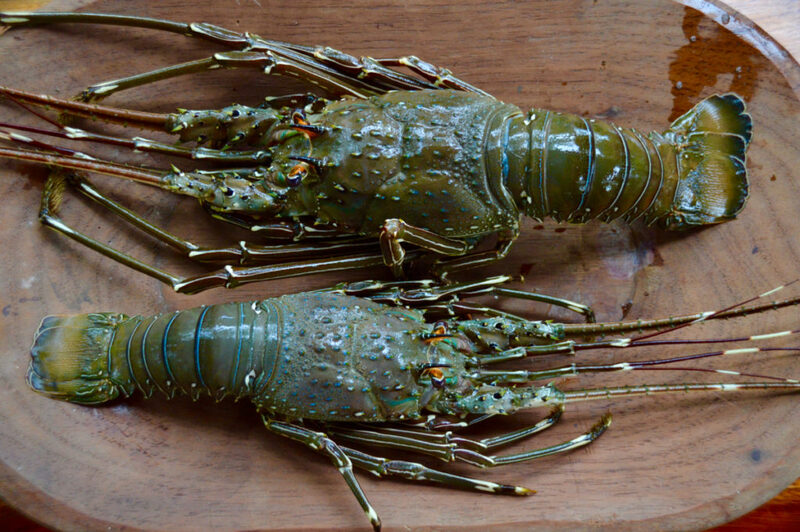 They are such colorful, cool looking lobsters. 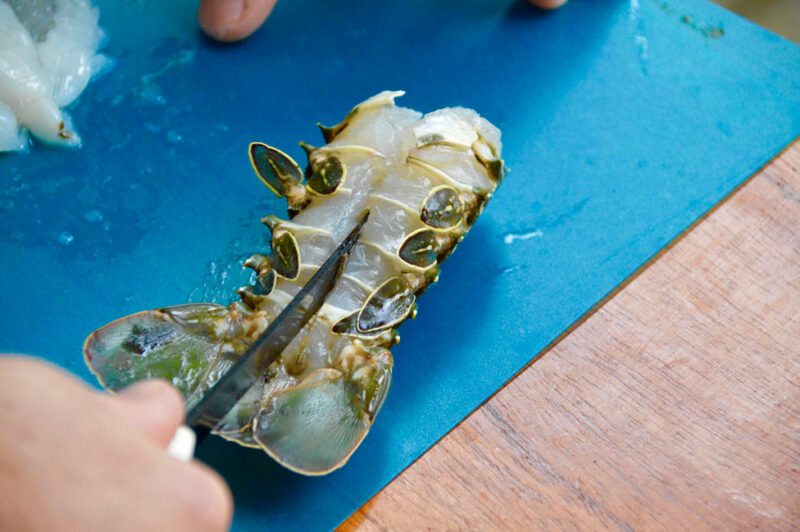 To prepare them for cooking, the first step is to cut off their tails and get as much of the meat out of the bottom of their bodies as you can. I like to use a towel when handling these guys because of their spikes, but that's Ryan's hand, and he really never cares..your choice! Next, use a very sharp knife to butterfly the tail into two pieces. Once that is done, mince about 4-6 cloves of garlic (this amount of garlic is good for two lobsters), and cut 4 TBS of butter, throwing it into a pan and letting the butter melt over medium heat. Once the butter has melted, place the tails meat side down, letting them cook for about 8 minutes, then flip the tails over to cook the other side. At this point, I had made a pot of rice, sauteed some chopped carrot, onion and pepper in some olive oil and salt, then mixed the two together. 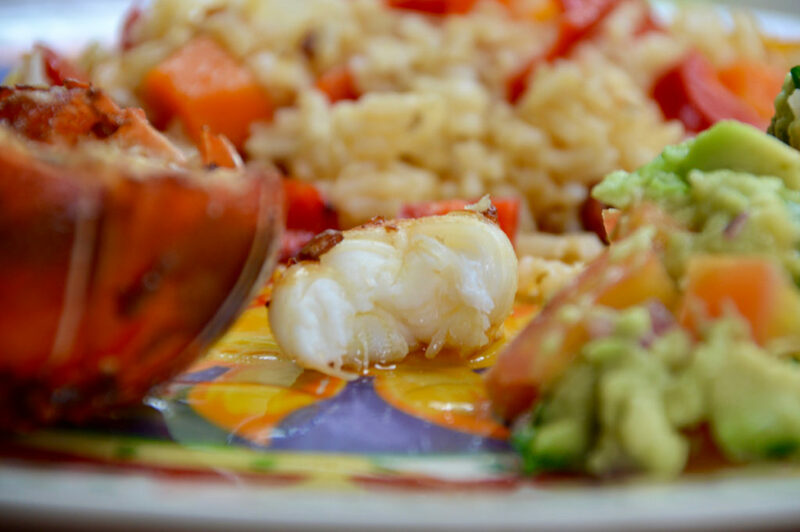 Once the lobster is fully cooked through, plate the lobster and spoon a little of the butter sauce over top, but then take the remaining sauce left over and add it to the rice. 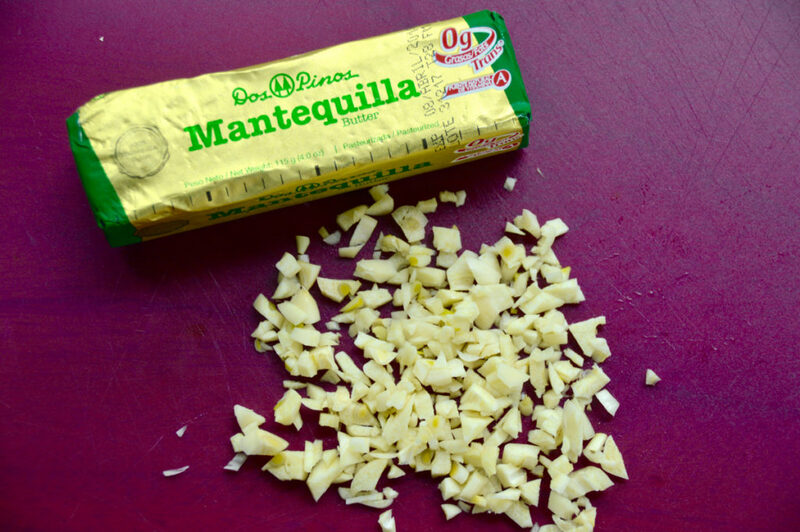 The garlic at this point should have crisped up (not burned, that would mean your heat was too high), and makes for a crunchy, flavorful addition to the rice. 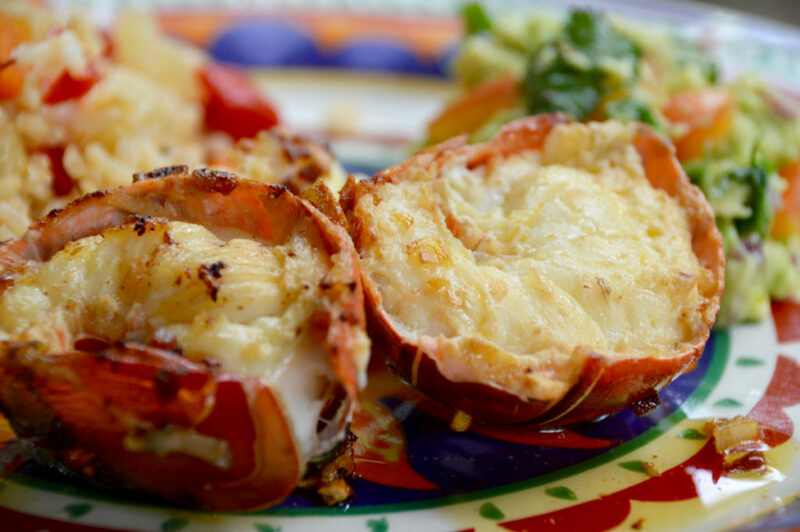 It is an easy, quick and flavorful way to make rock lobster, or any lobster!